Who has forgotten the importance of Democracy? Who has forgotten the importance of Democracy? Why so many people, especially younger groups, tend to undermine the democratic conquests previous generations fought for and achieved? Is it the post-recession, the fear for the future, or simple social indifference? Knowing that the world’s most competitive countries, 2017-2018, were: Switzerland, USA, Singapore, Netherlands, Germany, Hong Kong, Sweden, UK, Japan (lowest-ranking Asian country in the top-10 – used to be No1 among them), and Finland I had to find data for those and then add some representative non-EU economic powers (ie. Australia). My first questions were obvious. How is it possible that Germans drop in numbers? Do they have it in their DNA? Haven’t they realized that by only exporting 60 billion euro per year only in the Far East they have become a robust force in the global economy; that they acquire globally a nice business reputation which grants them more cooperation opportunities; that their universities now work for innovation? What is wrong with them? OK, you can say that Japan comes out of an authoritarian heritage and their monarchy system doesn’t come in your way. But the Netherlands? The country who invented the very concept of the company in the 1600’s? Which exports globally fine goods to more than 100 countries and its companies participate in conglomerates? (meaning that job safety, wealth, and opportunities are shared by almost everybody). 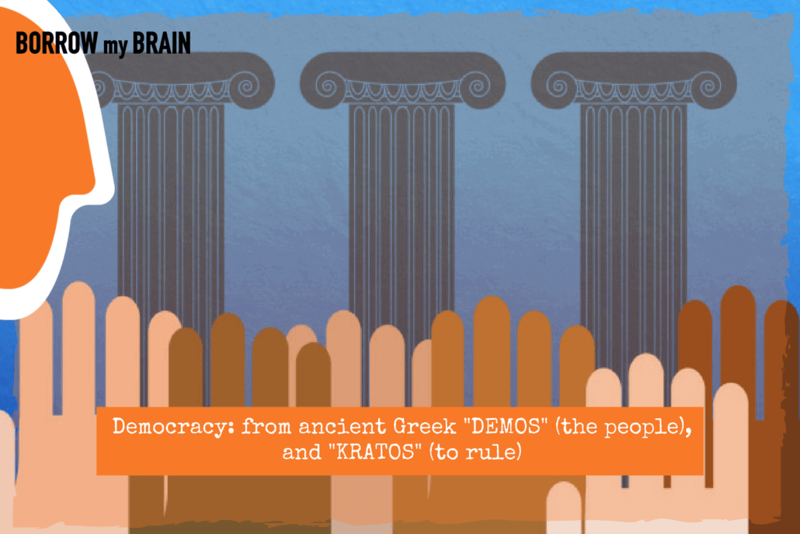 The word democracy comes from ancient Greek, with ‘demos’ meaning ‘the people’ and ‘kratos’ meaning ‘to rule’. So its literal meaning is rule by the people. In simple terms, democracy means that the people are entitled to influence important decisions that affect their lives. Instead of having one person making all the decisions in a country, democracy brings together the views and interests of all people so that the future of the country can be decided based on all these views. Democracy is rule by the majority. In the eyes of these younger people is this what happens every day? You can say that I’m an ordinary complacent guy, a family man. I have come in the piece with the “injustice” or lack of service of our democratic institutions. But do they see opportunities ahead? Do they feel that their voice and opinion matters? Do they trust our leadership? Trust…what a forgotten word! Do we have representative Democracy? Representative democracy or indirect democracy is when people choose to vote for who will represent them in a parliament. This is the most common form of democracy found across the world. Its emphasis lies on protecting the rights of not only the majority of the people in the state, but also the minorities. By electing a more qualified representative, a minority population would be able to vocalize its grievances in a more efficient manner. Most of the representative democracies of the world consider themselves to be liberal democracies. This is because they value the needs of their individual citizens more than that of the entire state. But is this the case? I sincerely wonder. Can young university students go tomorrow to their University’s Dean and propose changes in the curriculum? Can they ask their municipality to offer a new young-families’ service (ie. for working parents)? Are they entitled to see, discuss, and vote (before) in public consultations for the legislative work of their countries? Can they change the new (startup) companies’ taxation, which is a political agenda of every government? Is it possible that the democratic leadership and institutions we have today, are creating the feeling/perception, or treating younger people as real ‘minorities’ in every state? I don’t know if his communication officer thought of this agenda, or they needed some ‘sound bite’, but Emmanuel Macron in WEF, Davos was unique on the issue at hand. Addressing leaders and media stated, on the need for a new global compact, @EmmanuelMacron #Davos18 “If you can’t explain to people that globalization is good for them, they will join the nationalists, the extremists who want to get out of the system. And they will win. And it will happen in every country. Will we let people stay ignorant and in fear? I’m a father. A pro-European. A man who has positioned hundreds of corporations and thousands of service-product propositions. A positive mind. But I have to say that we practice our democracy in an old-fashioned, non-trusted, bureaucratic way. The globalization exploded in 2000 and today the forces of the internet have taken it to a whole new level. The speed of Change will never be as slow as it is today. Technology and its disruptions unleashed ‘hell’ for the average working man and young student. No one was prepared. Suddenly, everything automates. All things converge. A smart sensor, a grid, and a software routine might put out of owrk 5 employees. Opportunities lie outside the traditional educational system. Things will escalate in the next 20 years. But no one is explaining, what’s going on, and then no one puts in place some practical, innovative, helpful policies: retrain, re-energize, refocus people and their professions, skills, and routes. If you ask if this is the obligation of democratic institutions? Yes! Absolutely. Governments, Ministries, Mayors, Universities, Chambers, Associations all need to sit around the same table and redesign a more sustainable future. Then, it’s the absence of opportunities’ stupid! You drive a kid like a crazy horse, from course to course, from school to higher education. At the “end” of this frenzied race, we tell them “there’re no jobs”, admitting that technology, disruptions, and closed markets (I mean tough regulations) are to blame. Wrong! We have elected our leaders (and in a company context) to do the right thing. Tell the whole truth. Device with us a path of joint activation. Who will explain to youngsters the need for every 5 years change of skills, the growth of competence and possibly change in work paths? Who will tell them that the low-cost invasion of Far East products diminishes whole industries? Who can train the EU SME’s to search for innovation and growth, while retraining the youth in new directions? Will we leave this to the “get-rich-internet-webinars”, or the coaches? Trust is a perception (always), but its built on very practical things, decisions, policies, and actions that you see, feel (in your life, work) and you appreciate. Is this the route of our political and business leadership? You tell me. No, they won’t bring back to our democracy the non-believers by tweeting and creating nice web banners to promote their political agenda. Or they won’t win back the trusted partner perception of the employee (underpaid, taxed like crazy, and without appropriate line management). Leaders do not listen. I’ve been there. I have served two Prime Ministers’ electoral campaigns and two global CEO communication activations. They don’t hear. They only search for ‘catchy’ agendas and PR spins. Now there is twitter to show-off and ignite political allegations. But is this Trust building? Can the democracy ‘feeling’ come back to company employees, cut on their salaries, or reduced, while company leaders enjoy huge bonus schemes? Political scientists have a theory called “democratic consolidation,” which holds that once countries develop democratic institutions, a robust civil society and a certain level of wealth, their democracy is secure. For decades, global events seemed to support that idea. Data from Freedom House, a watchdog organization that measures democracy and freedom around the world, shows that the number of countries classified as “free” rose steadily from the mid-1970s to the early 2000s. Many Latin American countries transitioned from military rule to democracy; after the end of the Cold War, much of Eastern Europe followed suit. And longstanding liberal democracies in North America, Western Europe and Australia seemed more secure than ever. But since 2005, Freedom House’s index has shown a decline in global freedom each year. Is that a statistical anomaly, a result of a few random events in a relatively short period of time? Or does it indicate a meaningful pattern? Are young people fed up with our Democracy? Do we speak a different language? What frustrates over half of the 18-35 years old group of government leaders in their country, according to the World Economic Forum Global Shapers survey, is the abuse of power and corruption. The abuse of power if combined with the levels of bureaucracy and administrative barriers and lack of accountability turn younger ages away. Transparency International shows my country, Greece, in red colour when it reports. Some people in my age group have turned complacent “that’s the way things are”. But insincerity and lack of action trouble young people. One fifth feels that government and institutions don’t understand them. Trust! Edelman is making the headlines, every year, with its Trust Barometer (check the 2018 report here). The Edelman study r0eveals a world of seemingly stagnant distrust! People’s trust in business, government, NGOs and media remained largely unchanged from 2017 — 20 of 28 countries surveyed now lie in distruster territory. Yet dramatic shifts are taking place at the country level and within the institution of media. Edelman has an easy job measuring the lack of Trust. We can’t easily trust countries, political leaders and institutions. We can’t trust the news. We can’t follow silently everything that is posted on social media. Whom can we trust? If you are unemployed for three years are you going to trust the Minister’s X announcement on new fiscal and social policies? No, you can’t! If there’s someone to blame, look in the mirror. We have -as societies- manipulated the democratic institutions to absorb the ‘goodies’ of a booming (lent) market for 30 years. Now is the time to pay: for our routine, for no-innovation, fo no-repositioning, for watching the Chinese lowering prices and quality, for not altering the education systems, for voting with our hearts only! I start every business talk and customer briefing, since 1988, with the line “do they trust you?” and continue “bring me evidence/studies” because I know. I’ve seen it in my 30 years’ pro-life… someone always tries to do a shortcut. The Marketing Manager, the political candidate, the creative director, the mentee. They don’t look ahead and far. They look only in their turfs, for quick-wins, not into the long-term.